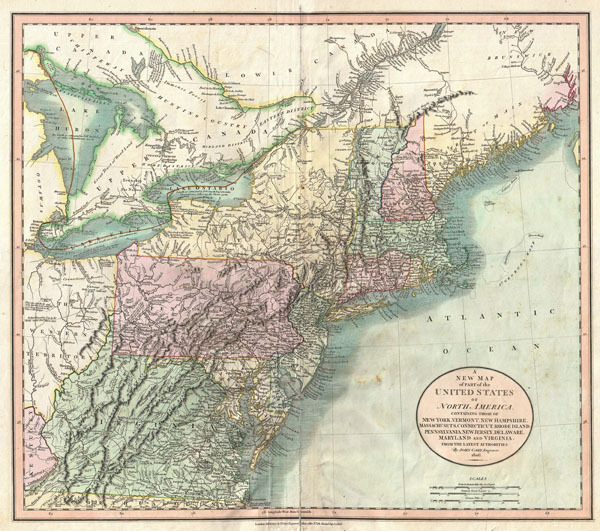 Published by John Cary in 1806, this is one of the most interesting atlas maps of the northeastern parts of the United States to appear in the early 19th century. Covers from Lake Huron southward as far as Virginia and North Carolina and eastward as far as the Atlantic Ocean. Includes the modern day states of Maine, New Hampshire, New York, Vermont, Massachusetts, Connecticut, Rhode Island, Pennsylvania, New Jersey, Maryland, Delaware, Virginia, West Virginia and Ohio as well as parts of Ontario and Quebec. The most interesting part of this map is the Northwest which is dedicated to the Great Lakes and the Western Territory. Notes the Connecticut's Western Reserve in what is today Ohio. The reserve, formally ceded to Connecticut after the Yankee-Pennamite Wars, was the last remnant of Connecticut's old colonial sea-to-sea grant of all territory falling between the 41st and 42nd parallels. Includes numbers references to the American Indian nations occupying the region, including the Chippewa, the Ootawas, and the Six Nations. Also notes the important cod fishing banks off Massachusetts and Maine. Prepared in 1806 by John Cary for issue in his magnificent 1808 New Universal Atlas. Very good condition. Minor creasing to the left of original centerfold. Old verso certerfold repair at bottom of map extending 6 inchs or so into map along centerfold - see image. Blank on veso.